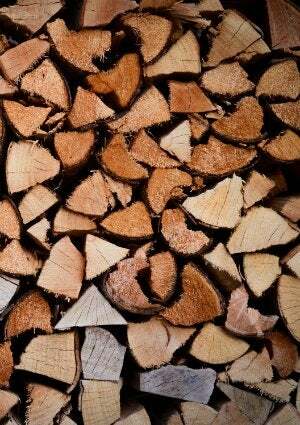 Splitting wood doesn’t have to be a backbreaking experience. Start with the right tools, the proper technique, and the following tips, and chopping logs will feel like a labor of love. Fireplace season has at long last arrived: Time to gather around the hearth, hunker down, and embrace the warmth of the flickering flames. But before you do, check that you’ve stockpiled enough seasoned firewood—logs that have been dried at least six months—to last the winter, because running out of fuel in the middle of a blizzard is less than ideal. If your stores of wood are lacking, it’s time to get to work: chop-chop! Once you’ve wrangled a steady supply, follow the instructions below to split the logs for better burning. Get ready to channel your inner lumberjack and practice the time-honored tradition of log-splitting to keep the fires burning all winter long. First, check that you’ve got the proper equipment. To the novice woodcutter, an ax may seem like the best choice of tool for splitting logs, but it’s not. While it’s great for chopping down trees and cutting smaller pieces of wood, the maul—with its wider head and heavier weight—is the expert’s choice for splitting firewood. To deal with gnarly logs riddled with tough fibers and tree branch notches that make splitting more difficult, you should also have a wedge or prying triangle on hand to help. Before you begin swinging any tools around, change into your protective gear (safety goggles, long pants, and sturdy boots) to avoid injury. 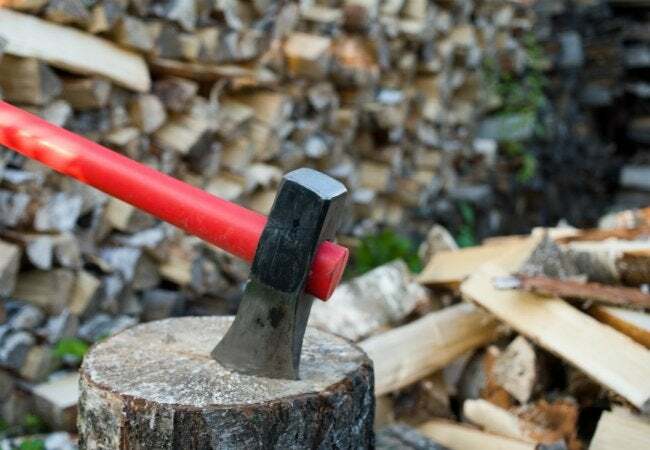 Wherever you plan to do your work, set up a short chopping block—consisting of either a large, level tree stump or a similarly short and wide chunk of wood—to increase effectiveness and decrease the chances of damaging the maul. The chopping block helps absorb the force of each blow and provides a spot for the blade to drive into when the maul breaks through the wood or you miss your mark. Nothing is more frustrating than having to bend over to replace a log every time you miss, or to pick up sticks once the wood splits. Solve this common problem by placing one large “round” or several smaller logs together inside the opening of a tire (a 15-inch car tire works well), then setting it on top of your chopping block. Not only will this keep your logs in place when you swing, but it will cut down on the number of times you need to reset the log or pick up wood pieces, thereby decreasing the stress on your back. Find the weak spots in your log, points where the wood naturally wants to split, and strike at these first for an easier cut. For example, cracks that radiate from the center are an optimal place to start. If none exist, the best strategy is to aim straight down the middle, using the proper technique described in the next step. And, finally, the swing! Contrary to popular belief, splitting wood is not about brute force; instead, its success hinges on proper placement and the sheer velocity of the swing. Using the correct stance—feet spread shoulder-width apart—face the “round” and place the maul head on the spot you plan to strike first, with your arms fully extended. Then, step back a half step. Holding the maul horizontally—waist high—bend your elbows and raise the maul over your head. As you bring your arms down, concentrate on driving the head of the maul straight through the log with Zen-like precision. Let the weight of the tool and the force of gravity do the work for you. Don’t make the common mistake of swinging the maul like a pendulum; instead, come down through the log in a vertical line—no arcing. If your log is covered with knots or is too thick to split after a few strikes from the maul, it’s time to insert the splitting wedges. Using a sledgehammer (or the flat striking face on the maul) drive the wedge down deep into the crack to increase the size of the split. The added force of a single wedge should do the trick; if not, drive a second wedge into a crack on the opposite side of the log to create another splinter. With any luck, this combination should work. Know when to quit: When you’re tired, it’s time to stop. That’s when injuries occur. Save some energy for the next day when, given all this practice, you should be well prepared to pick up where you left off. Meanwhile, grab a bundle of your split wood, head inside, and light a fire to enjoy the fruits of your labor.